MrSteam CU Series Commercial Generators meet rigid US requirements and internationally recognized testing standards, including UL. ASME steam pressure vessels are built to the ASME Boiler and Pressure Vessel Code requirements and are National Board Registered. Typical use: Large resorts, hotels and clubs operating all day every day. The integrated base means there is no need to construct a stand – saving you on extra costs. Backed by MrSteam’s limited warranty for commercial steam bath generators. 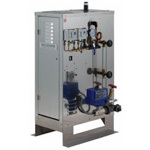 The CU Commercial Steam Systems will be tailored to your exacting needs by your Mr Steam representative.